Please CLICK HERE to download and/or print a map showing LCSD1 Area 1 (Rural) and Area 1 (Urban) inclement weather boundaries. Buses will not transport students if it is deemed to be unsafe. This decision is based on the district’s experience of being able to safely maneuver large, multi-passenger, 2-wheel-drive buses over public streets and county roads to safely transport our students to and from their destinations. If a rural inclement weather boundary is called, buses will not run in any rural boundary, despite conditions in your neighborhood. At the present time, LCSD1 does not have a universal method of individually calling only those who ride the buses. 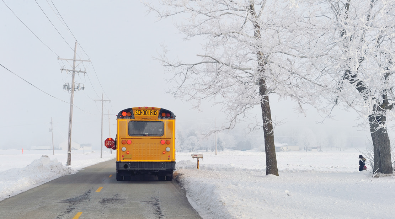 If weather conditions in rural boundaries warrant a bus cancellation, ShoutPoint, the district’s rapid-notification system, is not used for rural boundary bus cancellations. Please tune in to your local radio or TV station. We will also post these cancellations on the district website: www.laramie1.org. The only time ShoutPoint will be used is in the event that we have a district-wide closure of schools. LCSD1 does not bus outside the urban boundary during severe weather conditions. Parents living in the rural boundary who decide to take their children to school during these conditions, will be responsible for picking up their children in the afternoon. If buses are canceled that morning, they will not run in the afternoon. The attached map indicates the boundaries for busing. Families residing within the gray section of the map are considered to be living in the urban boundary. Those residing in the green area are considered to live in the rural boundary. In the event an individual bus route needs to be canceled, the district’s ShoutPoint automated message system will notify the primary contact on file for the route affected. Notification will be via e-mail, phone call, and/or text. Contact information in ShoutPoint is provided directly by parents. In order to receive these messages, parents and guardians are encouraged to keep their phone numbers and other pertinent information updated. Please CLICK HERE for a downloadable/printable PDF about weather notifications, weather closures and weather boundaries. All supervisors of children on playgrounds should be instructed to use good judgment regarding the needs of students during cold weather situations. Supervisors on playgrounds should understand what the procedures are to be regarding cold weather, individual student needs under these circumstances, and what the procedure will be should they determine that a shortened period of time on the playground is needed for all students. Please click this link for our air temperature and wind chill chart. Anytime temperature and/or wind chill are considered to be a comfort factor or hazard to students, special arrangements should be considered. As a guideline, it is suggested that anytime the actual temperature is at 20 degrees or below, special consideration should be given to duration of time outside before school, during recess, and at noon time. This would not preclude special consideration for students with health problems and/or inadequate clothing for temperatures below 20 degrees. Should the wind chill factor be 0 degrees or below, consideration should be given to allowing students to stay inside the building. Dress your child warmly in layers. Make sure ears, fingers, legs and toes are well covered. Change clothing if it becomes wet, especially socks and mittens. Limit outdoor time as much as possible. Be alert for early signs of frostnip and frostbite and teach your child what signs to watch for. Children with asthma may need to take special precautions. To help prevent an asthma attack, use face masks and scarves so children do not breathe in severe cold air.